Ramallah : External Affairs Minister Sushma Swaraj held talks with her Palestinian counterpart on Sunday, as she began her first visit to the West Asia region. Her agenda includes meetings in both Palestine and Israel, and to bring the matters on discussion table in Palestine, she began with her first discussions here. Palestine interactions are aimed at reaffirming India’s longstanding commitment to the Palestinian cause. Swaraj was welcomed by Palestine’s Assistant Minister of Foreign Affairs for Asia Ambassador Mazen Shamiyeh at the Bituniya Checkpoint as she crossed over from Israel to the Palestinian territory. As soon as she arrived in Palestine, Swaraj held talks with her counterpart Riyad al-Maliki. She also paid a floral tribute at Mahatma Gandhi’s bust in the soil of Palestine. The Indian Minister of Ecxternal Affairs was, earlier, given a red carpet welcome on her arrival at the airport in Tel Aviv last evening by Israeli officials. Swaraj’s visit comes three months after President Pranab Mukherjee’s historic trip to the region — his visit being the first by an Indian Head of State to the region. MEA Minister had a scheduled visit of meeting Palestinian President Mahmoud Abbas later in the day. The Minister was also proceeding to lay a wreath at the mausoleum of iconic Palestinian leader Yasser Arafat.Swaraj’s visit marks the inauguration of India-Palestine Digital Learning and Innovation Centre as part of capacity building efforts undertaken by the Indian government in Palestine. 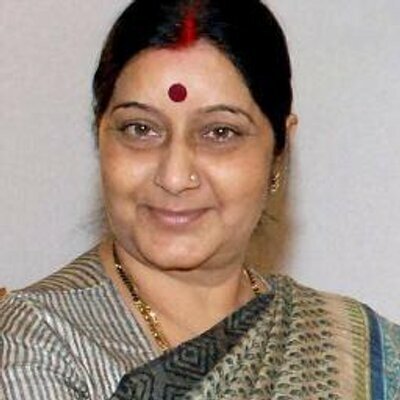 As a prelude to this visit by Swaraj, the External Affairs Ministry Spokesperson had categorically stated — This is the first visit of External Affairs Minister to West Asia region and Palestine is the first destination in the region which in itself reflects the importance India holds for Palestine in its engagement with the countries of the region. India is planning to execute several projects in Palestine to improve the living conditions of people. On this account, the Indian government has been active in capacity building by extending scholarships to Palestinian students and building schools. After her engagements in Palestine, Swaraj will head back to Israel for her two-day visit there during which she will have discussions with top Israeli leadership to review a whole range of areas of cooperation between the two countries. This would be followed by Swaraj’s reach out to Israeli President Reuven Rivlin, Prime Minister Benjamin Netanyahu, who also retains the portfolio of Foreign minister. The India Minister would also meet Israeli Defence Minister Moshe Ya’alon, Minister of Infrastructure Yuval Steinitz and deputy Foreign Minister Tsipi Hotovely.